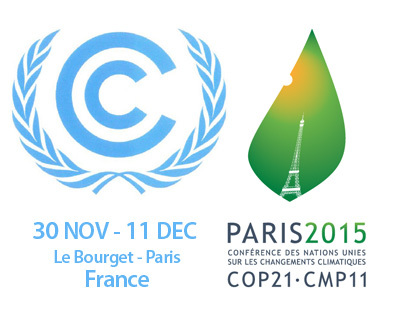 The UN Climate Change Conference in Paris, officially known as the 21st Conference of the Parties (COP21) to the United Nations Framework Convention on Climate Change (UNFCCC) is now underway. The goal of this massive meeting is to get 195 countries to agree on a deal that will reduce carbon emissions and limit global warming to 2°C (3.6°F) above pre-industrial levels. According to the latest IPCC report, the Earth’s average temperature has increased 1.5°F since the beginning of the Industrial Revolution in 1880. This may not sound like a lot, but it has huge and often interrelated impacts. As more and more heat is trapped in our atmosphere by increasing amounts of greenhouse gases, long established weather patterns are being altered. Different regions, therefore, are being affected in different ways. Some places are getting wetter and others dryer. Many areas are also seeing an increase in the frequency and intensity of extreme weather events. In the Arctic, a region on the front lines of climate change, warmer temperatures and changing precipitation patterns are causing glaciers to melt and consequently sea levels around the planet to rise. While world leaders agree that this is a global problem and something needs to be done, they have not been able to decide exactly what course of action to take. Developed and developing countries have long standing disagreements about how to deal with this critical issue, which is one of the major reasons why the last two attempts to reach a worldwide climate agreement – Kyoto in 1997 and Copenhagen in 2009 – failed. This time, however, there is a sound basis for some sort of meaningful deal. Laying the groundwork for this meeting, last year’s Lima Accord made history as all nations agreed for the first time to reduce their greenhouse gas emissions in some way. Under that agreement, every country had to submit an “intended nationally determined contribution” or INDC prior to the Paris summit in which they spell out how much CO2 they plan to cut based on their own political and economic situations. But, as they stand now, these collective pledges will not meet the 2°C (3.6°F) goal. Instead, according to a UN report, they would only limit global warming to between 2.7°C and 3.7°C (4.8°F to 6.6°F) by 2100. The negotiators in Paris have their work cut out for them, especially as any deal will have to pass by unanimous consent. The conference runs through December 11th. The 2015 Atlantic Hurricane Season officially ends today. For a third year in a row, it was slightly below average in terms of numbers. According to NOAA, there were eleven named storms this season. Of these, four developed into hurricanes and only two – Danny and Joaquin – were rated category 3 or higher on the Saffir-Simpson Scale. On average, the Atlantic produces twelve named storms, six hurricanes, and three major hurricanes (category-3 or higher) every year. Throughout the season, which runs from June 1st to November 30th, only two named storm made landfall in the U.S. Tropical Storm Ana, a somewhat rare pre-season storm, brought powerful winds and heavy rain to the coastal regions of both North and South Carolina in early May. It was the second earliest tropical cyclone on record to make landfall in the US. In June, Tropical Storm Bill slammed southeastern Texas with winds measured up to 60 mph and relentless rain that caused widespread flash flooding. The strongest storm to form in the Atlantic this year was Hurricane Joaquin. With winds measured up to 155 mph, it was rated category 4 – the strongest since Hurricane Igor in 2010. It was also a slow mover, battering the Bahamas for several days between late September and early October. This relatively quiet hurricane season was largely the result of El Niño conditions in the Pacific that generated wind-shear across the Gulf of Mexico and helped hinder most tropical development in the Atlantic basin. With a high temperature of 60°F in Central Park, the Thanksgiving holiday was unusually warm here in New York City this year. However, it was not a record breaker. That honor belongs to Thanksgiving Day 1925 when the temperature reached 72°F. That said, it was a far cry from the chilly high of 38°F that we experienced last year on Turkey Day. Our normal high for this time of year is 50°F. 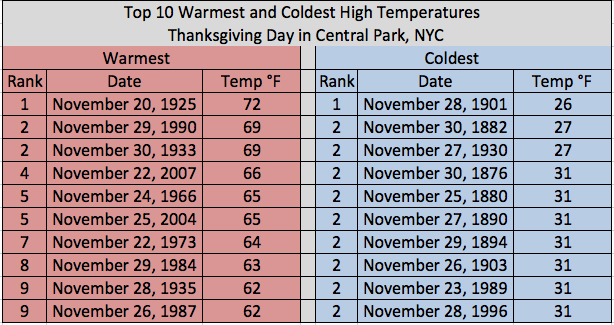 Below is a chart based on NWS data listing the top ten warmest and coldest Thanksgiving Days in NYC history. Happy Thanksgiving! Our global temperature continued its upward trend last month with October 2015 marking the warmest October ever recorded for the entire planet. According to the State of the Climate report by NOAA’s National Centers for Environmental Information, Earth’s combined average temperature for the month – over both land and sea surfaces – was 58.86°F, which is a whopping 1.76°F above the 20th century average. It surpassed the previous record set in October 2014 by 0.36°F. It also marked the highest departure from average for any month on record, eclipsing the previous record set just last month. October was also the sixth consecutive month this year to break a monthly temperature record. Although strong El Niño conditions – a natural climate phenomena that boosts oceanic and atmospheric temperatures – helped fuel October’s record warmth, it does not tell the whole story. The long-term trend of human-caused climate change was also a key factor. NOAA reports that fourteen of the fifteen warmest years on record have occurred since 2000 and they were not all El Niño years. While heat dominated most of the planet last month, some places were particularly warm, including most of Australia and North America. Here in the contiguous United States, with an average temperature of 57.4°F, it was our fourth warmest October on record and the warmest since 1963. Year to date, the first ten months of 2015 were the warmest of any year on record. This strengthens the likelihood that 2015 will surpass 2014 as the Earth’s warmest year ever recorded. Global temperature records date back to 1880. Climate change is a complex scientific subject with a plethora of data-rich reports that detail its diverse impacts. Not everyone, however, responds to facts and figures or charts and graphs. That is why art can help broaden the public conversation and help create new pathways to understanding this critical issue. On Monday, November 16th, I will be giving a presentation that I developed called The Art and Science of Climate Change at The Cooper Union Institute for Sustainable Design. Blending my two worlds, it introduces the basic science of climate change and explores how artists from around the globe are reacting to its various impacts and possible solutions. 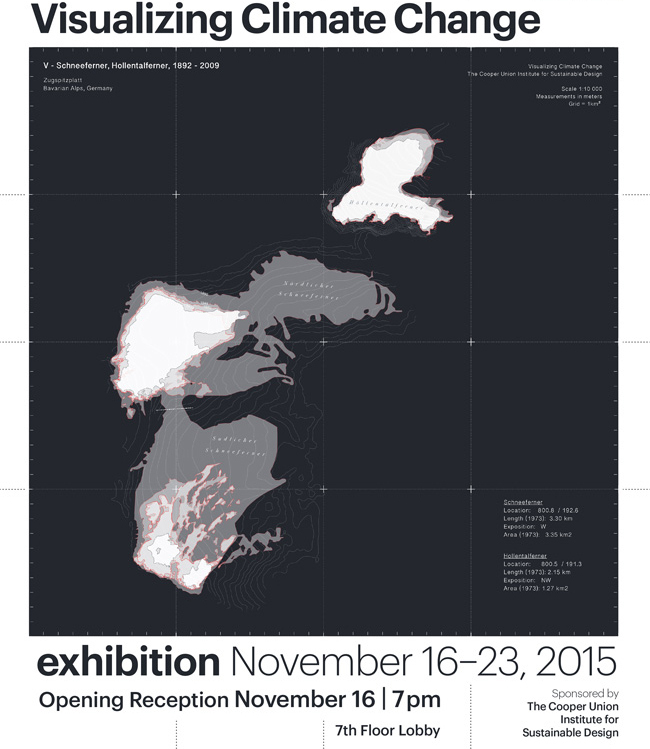 After the talk, there will be a reception for the group art exhibition, Visualizing Climate Change in which I will be showing images from my ongoing project on American Glaciers. The show runs through November 23rd. The lecture begins at 6PM and the gallery reception runs from 7PM to 8:30PM. But please note, to attend the talk you must RSVP via email to: isd@cooper.edu. Seats are limited. No RSVP is required for the exhibition reception following the talk. If you are in the area, please stop in and say hello. This event is co-sponsored by the SciArt Center. Please contact me to arrange a presentation for your organization. The Cooper Union Institute for Sustainable Design is bringing art and science together this month in an effort to expand public understanding of climate change. In a group exhibition called Visualizing Climate Change, artworks of various mediums explore the challenges of this pressing issue. “Each exhibited work,” according to the curators, “seeks to conflate the bounds of science, art, architecture and engineering in order to provide fresh insight, expression and understanding around specific issues of climate change.” The show is the culmination of a year long student fellowship program in which each participant pursued both scientific and visual research on particular aspects of our changing climate. Displaying the work of the student fellows as well as contributing artist Melissa Fleming, the exhibit runs from November 16 to 23. The opening reception is scheduled for Monday, November 16th from 7 to 8:30 PM in the 7th floor lobby of the Cooper Union Foundation Building at 7 East 7th Street, NYC. This event is free and open to the public. 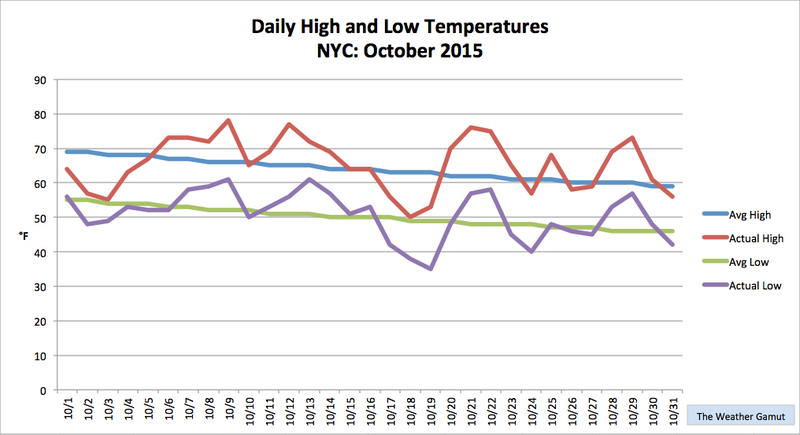 October was a weather roller-coaster in New York City this year. We had highs that ranged from a relatively balmy 78°F to a chilly 50°F. In the end though, the warmth won out. The city’s mean temperature for the month was 58°F, which is 1.1°F above average. On the precipitation side of things, October was mostly dry and marked the city’s fourth consecutive month with below average rainfall. In all, we received 3.91 inches of rain in Central Park, which is 0.49 inches below normal. Of this total, 1.44 inches fell in a single heavy rain event during the last week of the month. Despite this soaker, the city remains in a moderate drought according to the latest report (released on 10/29) from the US Drought Monitor.